Days are tiring for Jim Kowalczik at the Orphaned Wildlife Center (OWC) in Otisville, New York. 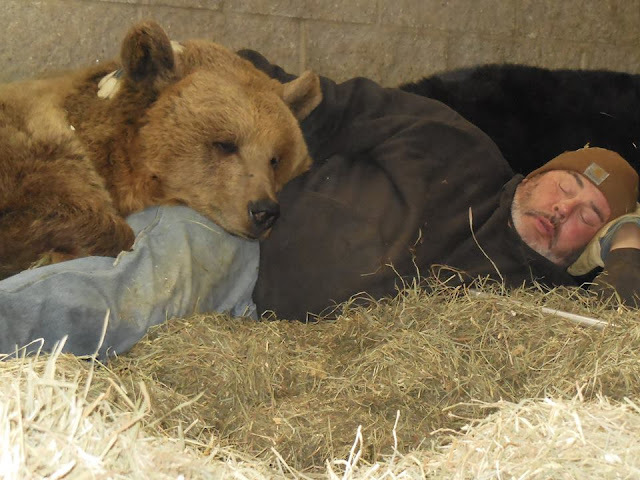 Between giving back rubs to the Jimbo the 1,500-pound Kodiak bear and playing in the snow with Jenny and Amy, two Syrian brown bears, he could use a little nap. 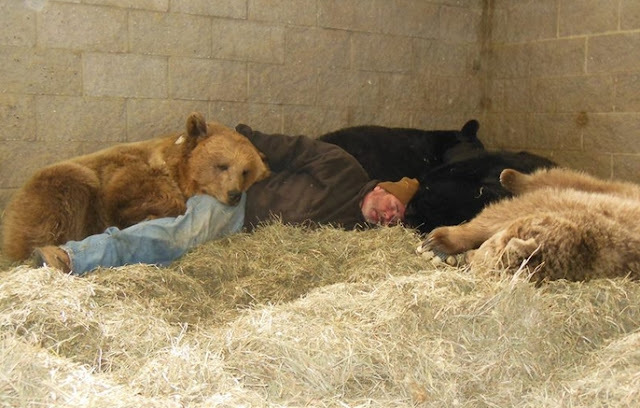 So that's exactly what he did.Nestled on a pile of hay, Kowalczik was photographed dozing off alongside four rescued Syrian bears. Direct contact with bears is controversial and generally ill-advised, because it's dangerous for both the humans and the bears. But Kowalczik seems to have formed a unique bond with Maddy, Judy, Jenny and Amy. About 10 years ago, these bears were rescued from a breeding program that closed down. They needed somewhere to go, but they were too acclimated to life with humans to return to the wild. Kowalczik and his wife, Susan, founded the OWC in the 1990s as a rehabilitation program for orphaned bears and a sanctuary for animals who were unable to return to the wild. When they heard about the family of Syrian bears in need of a home, they decided to take them in. Jim, Jenny and Amy playing together. Responses to "Man Snuggles Up To A Bunch Of Bears, Falls Asleep "
WHY? are they being kept in fenced area ?